Note: This is a fictitious company credit report. Actual reports may vary in the amount of information available per business profile and may not include all information seen in this sample. Click on the numbered icons below for more details. Ultimate Parent National Medical Center, Inc.
Parent / Headquarters Crocker Medical, Inc. 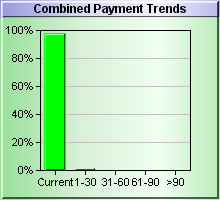 The objective of the Experian Business Credit Score is to predict payment behavior. High Risk means that there is a significant probability of delinquent payment. Low Risk means that there is a good probability of on-time payment. Business Credit Scores range from a low of 1 to high of 100 with this company receiving a score of 60. Higher scores indicate lower risk. This score predicts the likelihood of serious credit delinquencies within the next 12 months. This score uses tradeline and collections information, public filings as well as other variables to predict future risk. • Number of commercial collection accounts. • Risk associated with the company&apos;s industry sector. • Balance to high credit ratio for other commercial accounts. • Risk associated with the business type. Financial Stability Risk Ratings range from a low of 1 to high of 5 with this company receiving a rating of 1. Lower ratings indicate lower risk. Experian categorizes all businesses to fit within one of the five risk segments. This rating predicts the likelihood of payment default and/or bankruptcy within the next 12 months. This rating uses tradeline and collections information, public filings as well as other variables to predict future risk. Company background: Founded in 1971 and headquartered in Ardmore, PA, LaSalle Medical operates several hospitals in the state of PA.
*Newly Reported distribution with DBT. * The information herein is furnished in confidence for your exclusive use for legitimate business purposes and shall not be reproduced, disclosed, or shared to any third party per the restrictions in the Terms and Conditions. Neither Experian nor its sources or distributors warrant such information nor shall they be liable for your use or reliance upon it.